Lee Petra Grebenau is an Israeli couture bridal dress designer. Her collections are exquisite and feature endless intricate detailing. This is a stunning princess silhouette gown with an illusion bodice and high neckline that gives the illusion of lightness. The dress has long sleeves and a sheer back, it is fully buttoned fastening. the bodice has some stretch which makes it hug you perfectly and feels amazing. I wore the dress at the church for my wedding in August, it was breath-taking and to say everyone actually gasped at how stunning it was is an understatement. The light hits the fine intricate beaded and sequined flowers and acts as a glitter ball. It twinkles. I wore breast covers on the day which were all I needed to cover my modesty. The dress is in absolutely immaculate condition as I had a second dress I wore for the rest of the day, my smallest bridesmaid also held my dress so it barely touched the floor. 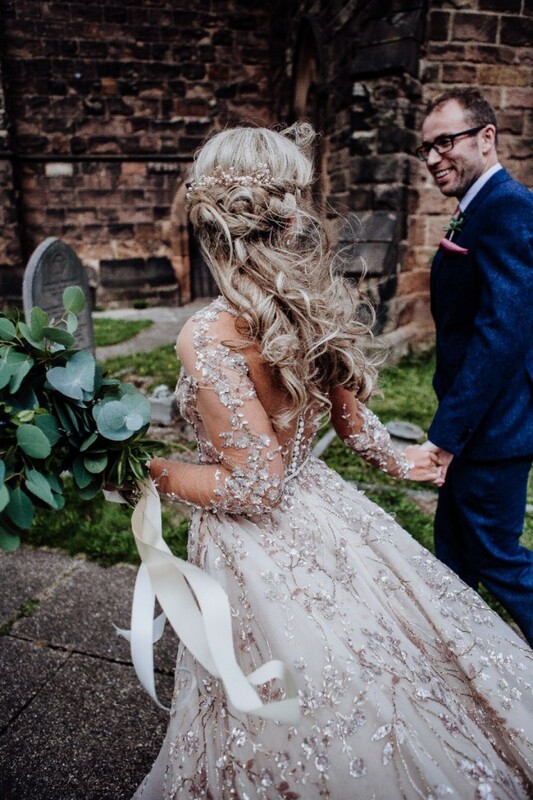 I have a beautiful chapel length veil that I will include, I also have all of the bits of beadwork that were taken from the dress when it was altered which you can add to the veil to make it match perfectly. Cost of dress when purchased: £9000 but I had £1000 worth of alternations undertaken for best fit. This dress really is the most beautiful thing i have ever seen. It was one of the more expensive dresses from Lee Grebenau 2017 Swan Lake collection. the beading and details are so intricate, the craftsmanship that has gone into this dress is truly stunning. The pictures do not do this dress any justice, it is absolutely breathtaking and such a lightweight dress to wear. The train is beautiful and elegantly long. This dress is not available anywhere else preowned that i have seen and samples are not available / rare. I am open to reasonable offers and will hold the dress for someone for a small deposit. Once you send a message, Clare can invite you to purchase the dress.